Tip # 279: Out of the Gutter! Leaves, twigs, dust. Seem harmless, right? But when these stray bits reside in your gutters, they cause more trouble than you might imagine. From flooding to cracked foundations, roof damage to icy sidewalks, improperly maintained gutters are at the heart of many property damage issues. Are parts of your landscaping yellow or dying? Over-watering caused by clogged gutters may be the culprit. Gutter-cleaning is not brain surgery, but it has its hazards. The biggest problem is timing — catching the window between falling leaves and a sudden winter storm that delays the project for days or weeks. Enjoy those fall leaves as they turn bright colors, but keep an eye out for early winter weather, so you are not caught off guard with clogged gutters and damage to your rental property. Anyone who’s done it will say that cleaning gutters is a messy job, and it’s not fun. But ignoring the problem or putting it off until next year is not an option. Sometimes ignorance is bliss. 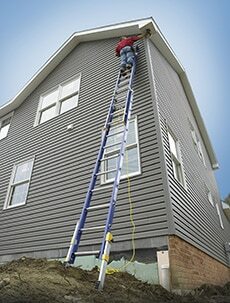 If you don’t want to know what’s swimming around up there, you can always farm out gutter cleaning to the pros. Check out the AAOA Vendor Directory to find contractors near you.